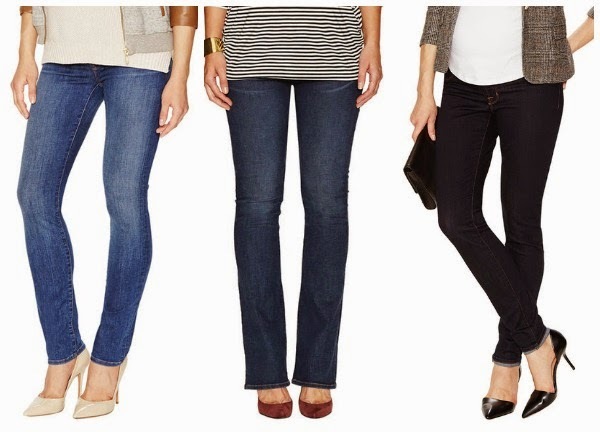 My main purchases this month were the three pairs of J Brand maternity jeans that I picked up. All of them have the front pockets replaced with elastic, as in the picture below. They are really comfortable, especially for where I am at with my pregnancy. I am hoping they still work well as I get into my third trimester, but I think they will! I am loving the three different styles I picked out. The length on each of them is perfect for me at 5'7''; I didn't have to worry about getting them hemmed. FYI - Gilt also has some pretty good deals on regular J Brand jeans right now - along with many other brands, including 7 for All Mankind, Current Elliott, and Hudson Jeans. 4. Tribal Clothing Poncho, Gigi's Boutique - $110 - I wore this in my most recent post and I love it! Perfect for pregnancy and beyond. Use Promo Code 1CEA07721 for 2 free maternity bands or 1 free body band. Add additional maternity bands for $7 or body bands for $10. Total Spent: $331 - a little high but most of it was the maternity jeans which I'm really happy I got since I have worn them a bunch already. I should be keeping the rest of my shopping pretty low for the rest of my pregnancy. Oh and I forgot to include these awesome fleece PJs that I bought at Target today for $12. (They were cheaper in store than they are online.) Other than adding some new tights, I think I should be in pretty good shape clothes-wise, so we'll see if I even have any purchases to make budget posts in the next few months. Linking up with Fran and the budgeting bloggers! Of course you need some awesome and comfy maternity jeans and love all that you selected. But I am in love with the beautiful poncho, especially.